When Travelodge embarked on the development of a new hotel in Darlington Energy Gain UK undertook the analysis of the energy losses for the proposed building and presentation of findings on building compliance and renewable energy options to meet a 10% contribution. 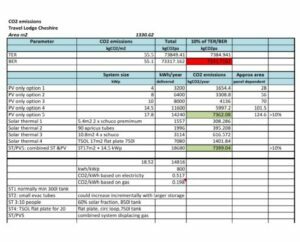 Scope Analysis of the energy losses for the proposed building and presentation of findings on building compliance and renewable energy options to meet a 10% contribution. The dynamic model was built to evaluate building performance. As a complete analysis tool it allows packages in thermal, energy and carbon performance including Part L compliance, solar and mechanical and electrical design. 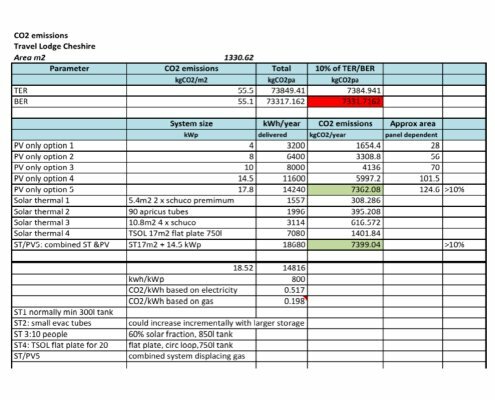 Numerous cases were modelled and a number of technologies analysed including: gas boilers, electric space heating, solar PV, solar thermal, CHP, biomass, lighting controls, MVHR and Optimisation. The results were analysed and the optimum solution offered to the client considering: end user requirments, financial returns, capital expenditure, whole life management, space and planning requirements.